We are a leading Manufacturer of hydraulic adapter from Ahmedabad, India. 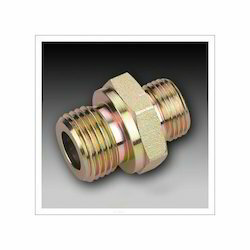 Being a well-established organization, we bring forth an excellent assortment of Hydraulic Adapter for our clients. Our offered adapter is widely appreciated by the clients for its rigid construction and fine finish. The provided adapter can be availed in variegated sizes, designs and specifications as per the needs of our clients. Apart from this, we offer this adapter to our clients at market leading prices.